inspiration | That's All I Got! In June, I signed up to participate in the 2018 Readers’ Favorite International Book Award Contest. Today, I was notified that my book has finished its review and received a 5 star rating (in all five criteria). The review is listed below. That’s All I Got! Thrival: A Widow’s Journey After Suicide by Karen E. Voss is the author’s poignant and heartbreaking memoir as she shares her pain through the book and gives readers an intimate look into her life of grief, loss, and betrayal. The book sheds light on the daily struggles of those living with mental illness, and those who deal with the effects of loving and living with someone who has mental illness. The author speaks about reaching out for help during her days of struggles, and how it is possible to live an extraordinary life again. Her journey after her husband Russ’s suicide will touch the hearts of readers in many ways. Her story is one of pain, grief, betrayal, survival, thrival, hope, and recovery. The author’s words are not only about her trauma and pain; she gives a good perception to readers about what it takes when it comes to living and dealing with people with mental illness. She speaks about her life extensively and intimately, and her moments of despair and difficult times are palpable. The book reaches out to readers through the author’s words and prayers and she calls herself a ‘thriver’, a warrior moving forward after tragedy, instead of a survivor. The book also sheds light on the alternate and holistic types of healing and well being that are helpful when it comes to treating mental illness. Stories like this will touch the hearts of readers – and many of them will be able to connect with the author’s pain and tragedy – but will also help them overcome their trauma and get on with their lives. I read the above quote in the article, “Finding Strength” in Great Loss” from the May 2017 issue of Redbook Magazine. The only other times I have seen the words post-traumatic have been during references of PTSD (post-traumatic stress disorder). Post-traumatic growth refers to growth after trauma and following grief. While I haven’t used the words, I too have experienced post-traumatic growth. In December 2017, nine years passed since my husband completed suicide. Due to the traumatic events, I dealt with, worked through, and overcame PTSD. Since then I have persevered. With tools and resources to assist, I THRIVED! In order to thrive, one must be able to work through their troubled waters. With the support of family, friends, a wellness team, my faith, keeping physically active, and other programs, I navigated the rough waters and arrived safely to shore. The tools I gathered along the way continue to fuel my journey of thrival. with Harper Collins, I’m published once again. Project Semicolon called out for contributors to share their story in the book Project Semicolon: Your Story Isn’t Over gearing towards 18-25 yr olds, ages where people are more susceptible to mental illness and contemplating suicide. Please consider purchasing this book for anyone you know who might find it useful and want to discover stories of courage, strength, and perseverance. Because like the ; stands for; their stories aren’t over yet. 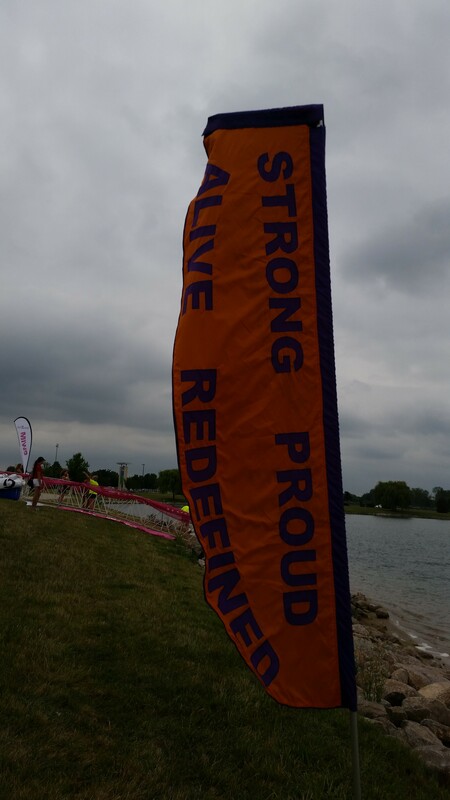 On Sunday, August 9, 2015, I completed my fourth ever Sprint Tri(athlon) with this as my third Iron Girl Triathlon. My seventh wedding anniversary also took place on this day. I knew the day would take every ounce of energy-physical, mental, and emotional – I had before the day concluded. On Saturday night, while I prepared and packed for the Tri, I pinned two Angel pins near the right shoulder of the shirt that would cover my swimsuit for the cycling and running segments of the Tri. These Angels represented my husband, Russ, sitting on my shoulder as I completed the Tri. He didn’t disappoint me as I persevered through the challenges. Many Angels surrounded me as I swam 1/2 mile, cycled 12 miles and ran/walked 31 miles. Not only did Russ and other Heavenly Angels sit on my shoulders, but Team Phoenix members were all around me. Team Phoenix this year composed of 47 cancer survivors either in treatment or remission. Most of them survived breast cancer and all of them were first time triathletes. They rallied before starting and you couldn’t help but feed off their energy. This strong group of women inspired me to keep going even when I started tiring. I stuck around until the last triathlete crossed the finish line and it happened that it was a member of Team Phoenix. The entire team went back on the run course to finish the race with her and everyone else associated with the team waited for her on the other side of the finish line. They even had a ribbon for her to cross. Many people shed tears including me. These tears represented joy, hope, strength, inspiration, and love. We’ve all overcome challenges and tragedies on our journeys and continue to inspire others. We’re all thriving overcomers! What may seem insignificant to some represents something bigger to another. Today, I made the bed. Exactly six years ago today, my husband made the bed that morning. I didn’t sleep in the bed for two months. Not doing so allowed me to hold a piece of him because you see he passed away that morning. Today, I balanced the checkbook. Balancing the checkbook and keeping track of that account became my job. I always did it and tracked down the missing check or two. I had stopped this. Sure, I knew the day-to-day after all there’s online banking. However, this morning I made sure the numbers were correct and then wrote a contribution check for church and listed the balance. Today, I changed the plan. My original plan today started with going to church, visiting at the cemetery and arriving home in time for the start of the Packers game. That’s until I received a text from a good friend asking to get together to catch up. I replied sure. We met up after church for hot chocolate, a pastry, and conversation before I headed to the cemetery. I missed the first quarter of the game and that’s OK.
Today, I visited the cemetery. This isn’t unusual for me to do on special days or just because. Today while there, I wrote a bit inspired by God and influenced by my faith for God takes care of us no matter what’s happening in our lives. Today, I mailed the Christmas cards. This isn’t unusual or something new, but the time frame changed this year from years past. I’ve been good about sending them out early, but this year life got in the way. I realized it’s the same weekend six years ago that we sent out Christmas cards containing our wedding photo. Most everyone received those cards on Monday, the day after my husband passed away; a bittersweet photo. Today, I heard a siren. The siren stopped on the next block to the south. Six years ago, the sirens stopped at our house. They left with a physical body whose heart stopped beating and his lungs stopped breathing as a result of asphyxiation. There’s nothing anyone could have done. Today, I watched a movie. Not just any movie, but a special one, The Muppet Christmas Carol. This movie holds a special place in my heart because during this movie, Russ changed the words of the song, “When Love is Gone” to when love is found and then told me that he loves me (less than two months into our relationship and yet my heart knew that I loved him at two weeks). I shed a few tears during the movie and even if parts of it weren’t special, I’d still shed tears. The night continues with a movie he became attached to and to the song, “Hot Chocolate”. It’s time to board The Polar Express. Today, I made the bed. It’s been almost a month since That’s All I Got showed its face around town. There’s been a good response and I’m one book away from selling my first 50 personally! My cousin’s wife who mentioned in the book passed away last week and she never got to see it so I chose to gift a copy to my cousin at the funeral home last night. Yesterday morning, my other blog, Inspiring Thru Thought, published the tribute I wrote for her, In Memory of an Author, that’s received a positive response both in comments on facebook and in person. I knew my book could help inspire others, but I never thought a blog post could touch so many lives. This leads me believe that I have a knack to help others. I’m currently in the process of getting That’s All I Got approved by AFSP (American Foundation for Suicide Prevention) in the coming months. I’m confident it’ll pass inspection and then I can send it to other markets/areas to help others. In the meantime, I have three upcoming events; two of which are at the South Shore YMCA here in Milwaukee and one at my church dinner. All of these events are listed on this blogs main page and through EventBrite. Exciting times!